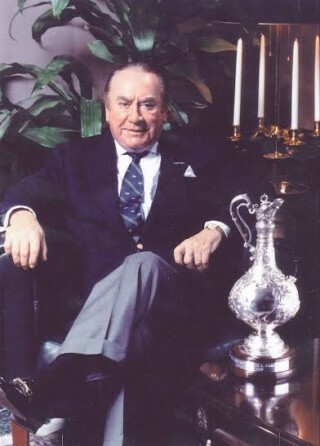 Hugh Carey, whose grandfather Michael Carey (baptised Kirrane) and grandmother Delia Graham (baptised Grehan) were both from Milltown, was Governor of New York from 1974 to 1982. He was born in Brooklyn, New York in 1919. He received his primary degree in 1942 and his law degree in 1951 from St. John’s University. He also served with the U.S. Army in WWII, seeing action in France, Belgium, the Netherlands and Germany, and was present at the liberation of prisoners from Nordhausen (Mittelbau-Dora) concentration camp. By the time he was discharged from service in 1946, he was a lieutenant colonel, wearing the Bronze Star, the Croix de Guerre with Silver Star and a Combat Infantryman’s Badge. As a member of the Democratic Party, Hugh Carey served as a Congressman in the United States House of Representatives from 1960 to 1974. He was first elected Governor of New York in 1974 and re-elected in 1978. He was the first Democrat re-elected Governor for 40 years. It is a generally accepted fact that he was mainly responsible for saving New York from bankruptcy in 1975. He was also deeply involved with other well-known US politicians in seeking to find a peaceful solution to the Northern Ireland Troubles and was one of the so-called “Four Horsemen” with Speaker Tip O’Neill and Senators Ted Kennedy and Daniel Moynihan. During his time as Governor, Carey brought in reforms in the treatment of the mentally ill, abolishing the large institutions and providing community care. He changed the system of electing senior judges to selection on merit and oversaw several economic development projects in New York. He was very proud of his Irish heritage and made many trips to Ireland. He visited Milltown in 1960 with a view to establishing his roots. Hugh Carey passed away on August 7th 2011, at his home in Shelter Island, New York, with his funeral Mass taking place at St. Patrick’s Cathedral. A plaque was erected to his memory in Milltown Heritage Park in September 2012 and unveiled by his grandson Erich Carey. This page was added on 29/01/2015.